I think I’m becoming a running-event snob. Last year I participated in a St. Patrick’s Day 10K, and although I really enjoyed it, it was a pretty small and low-key event. There weren’t a ton of people, and even though everyone was dressed in green it just wasn’t buzzing with the race-day energy I’ve grown to love at larger events. It was my first 10K and I’d gone by myself, so I’m sure I would have had more fun if it had been a shorter race and I’d had a friend with me (or even someone at the finish line), but in the end I showed up in my green, ran my race, and left – as did everyone else who participated. 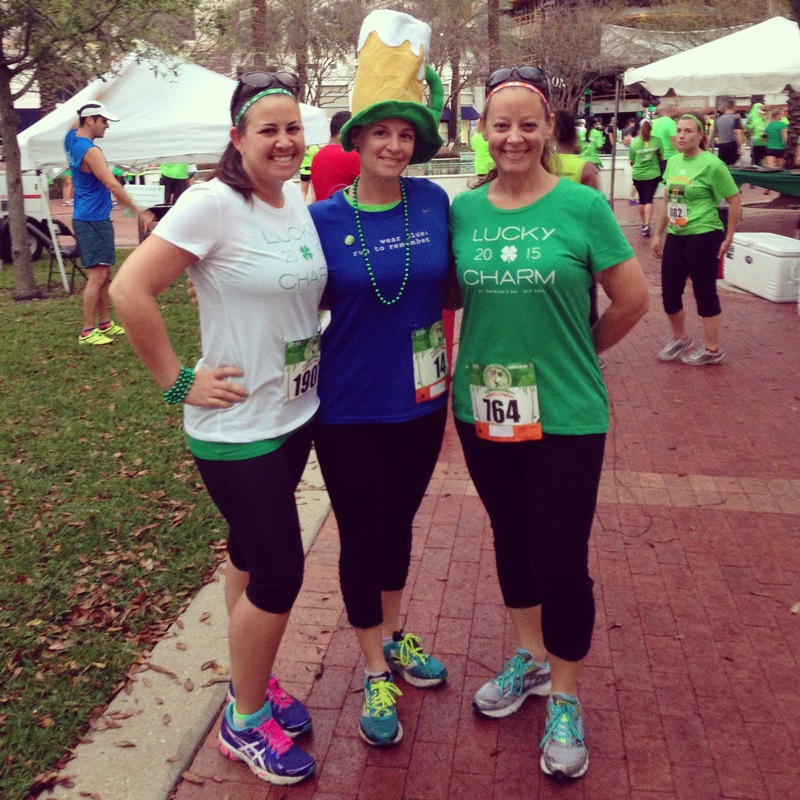 This year my friends Jen and Carolyn wanted to sign up for a different St. Patrick’s Day run, one that was being held downtown. Since every participant over 21 would receive a free beer it was sure to draw a larger crowd. It was also a 4-Miler (an uncommon race milage), offered a finisher’s medal, and was the kick-off event to a huge St. Patrick’s Day festival being held downtown that day. It was definitely looking to be the energized event I’d grown to love. Jen and I found some fun St. Patrick’s Day shirts at Old Navy for about $5 and bought them just in case we decided we didn’t like the event shirts (which actually turned out to be pretty cute). Our event packets also came with long green bead necklaces, and we wrapped them around our wrists like bracelets so they wouldn’t smack us in the face as we ran. The course took us down one of the main downtown roads and then doubled back, as opposed to weaving through the city blocks like other runs that I’ve been to in the same area. It was my first 4-Miler, and I really loved it. I try to make sure I’m always able to run 3 miles, so a 4-mile run pushes me a little harder than normal without being quite as strenuous as a 6.2-mile 10K run would be. Plus it was nice to be able to add a new distance to my list of completed runs! After the run we received our medals, which featured a funny little leprechaun, the same image the event shirts had on the front. Then Jen, Carolyn, and I went to the beer tent with our free beer tickets, and while they enjoyed their drinks I traded mine to a guy in exchange for taking this photo. I hate beer.